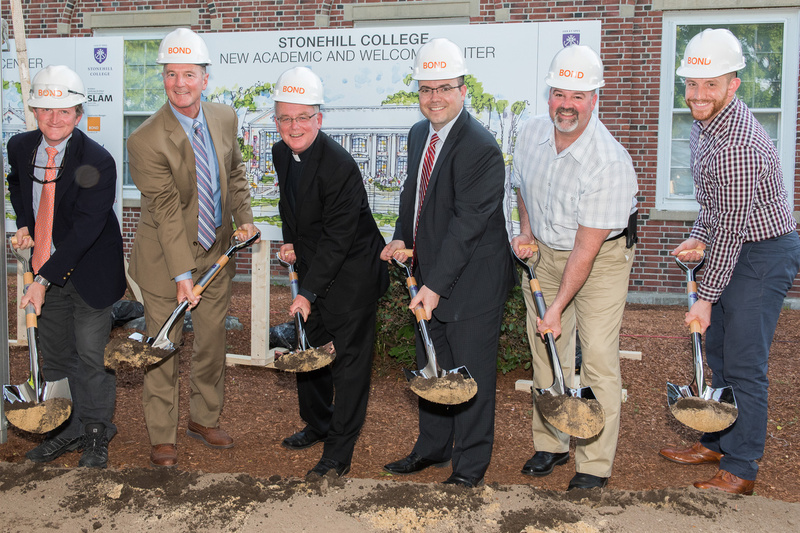 (Boston, MA) – BOND, the Northeast’s premier building, civil, utility and energy construction firm, recently celebrated the groundbreaking of Stonehill College’s Academic & Welcome Center. The ceremony was attended by members of the College, academic administrators, trustees, students, faculty, staff as well as the BOND project team and design partner S/L/A/M Collaborative. BOND is providing preconstruction and construction management services for the 35,000 square-foot academic & welcome center, built on the site of the Old Student Union. The Center will feature an admissions room with tiered seating for more than 50 people, administrative and faculty offices, a 350-seat auditorium, classrooms, meeting spaces, bookstore and Au Bon Pain Café. The new Center will serve as a welcoming focal point to the college, offering students a wonderful introduction to the campus, as well as demonstrating the value of a Stonehill education. It’s also the cornerstone building of a series of improvements to the academic quadrangle. The project is currently on-track, within budget and slated for completion August 2018 in time for the academic school year.